Great quality items from a renowned and experienced fishing product manufacturer. General use rod with design features that make it a must-have piece of kit for kayak fishing. Have a look at the rest of our fishing products for a range of rods, reels, hooks, lures, spinners, sinkers and more. The festival rod is brightly coloured and is designed with kayaking in mind. Although a great quality all-round rod, the 3 piece feature makes it especially great for kayaking. 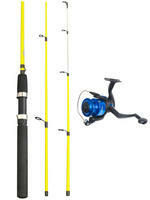 Furthermore, its 7 foot length makes it very popular with anglers due to its exceptional control of even the larger fish. This bundle comes with a foam handle, ceramic guides, FRP (fibre reinforced plastic) graphite reel seat and a cloth bag. The rod is constructed using extremely fine basalt fibres as used in the aerospace industry giving it exceptional durability and increased resistance to extremes of heat, moisture and UV light. The properties of basalt, a volcanic rock, are similar to those of carbon fibre and fibreglass, but the physicomechanical properties are significantly better; conveying not only incredible strength, but also perfect power transmission, enhanced fighting action, high torque and lifting power. 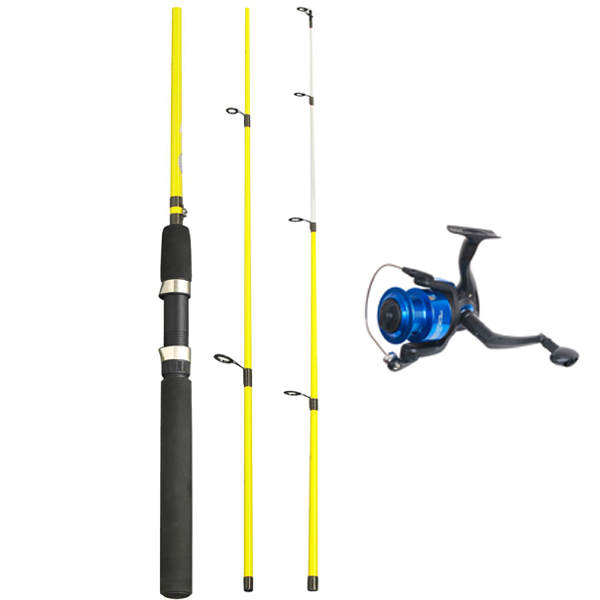 This is the slimmest, toughest and lightest rod that one could ask for! Excellent multipurpose reel and is the ideal companion to the festival kayak rod. Front drag, instant anti-reverse and 3 ball bearings.